For the past 17 years*, all I’ve wanted to make a summer complete is to eat an ice cream cone. From an ice cream parlor. Not in a cup, not a pint of Ben and Jerry’s that I snarfle down, but a cone. An actual honest-to-goodness cone. Why? Because to me ice cream cones are the ultimate symbol of summer. Sitting outside in the hot, sticky sun, with creamy, melty ice cream piled high that you eat down bite by bite. So when Swede and I took a quick trip to Door County a few weeks ago, I was absolutely adamant that we stop at an ice cream shop and get ourselves a cone. 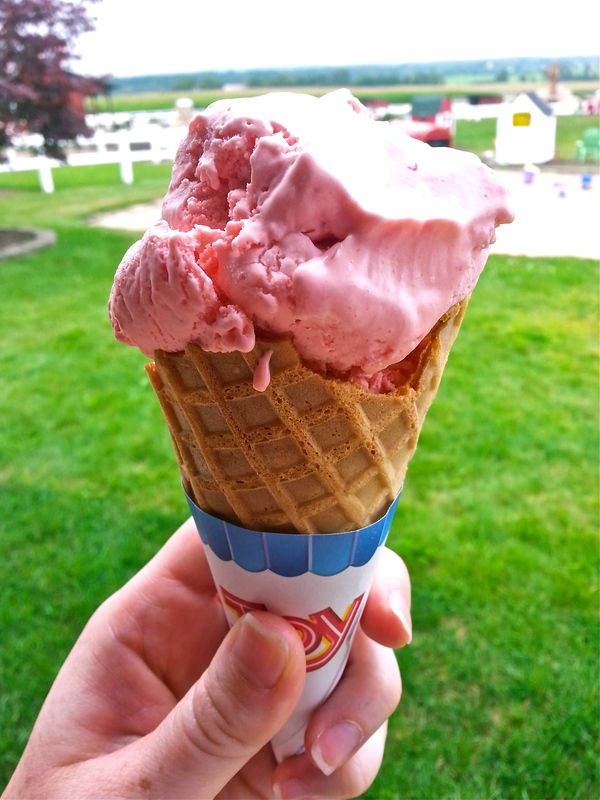 Driving past fields and farms, we drove by a dairy advertising homemade ice cream. I can’t remember the name of it now, but their list wasn’t extensive, which was okay by me. 31 Flavors this was not, and gold medal ribbon was not anywhere in sight, but you know what was? And thus the discovery was made that I am a sucker for homemade strawberry ice cream. And thus my summer was complete.